A complete overhaul to teamkilling reverses damage back on offenders and lets players forgive accidental kills. Ubisoft is taking a new approach to deal with Rainbow Six Siege's teamkilling problem. In a new blog post, Ubi detailed the new rules going into testing. Instead of kicking players after two teamkills, all damage dealt to the offender after the first teamkill will be reversed onto them. If the teamkill was truly an accident, the victim is able to "forgive" and not activate a penalty. "The goal of this system is to contain the impact of players abusing the friendly fire mechanic, while maintaining a degree of flexibility for accidents," reads the post. When the reverse damage mechanic was first tested in the last test server, some players worried it was too harsh a punishment for a truly accidental teamkill. The piece of the puzzle that seemed to be missing was the forgive option. Players have been asking for a forgive option for years, but Ubi has been strangely silent on the subject until recently. For the pure of heart who don't teamkill on purpose, the changes shouldn't have much of an impact for you. With the status quo, a griefer could get away with two TKs before being booted from the match. Now, the griefer will get one kill in, assumedly be unforgiven, and no longer be able to cause harm to anyone but themselves. This also goes for gadget damage, apparently. If reverse damage is active and you shoot a teammate with a shock drone, the damage is reversed onto the drone, not the user. I'd really like to see a shock drone suddenly self destruct. 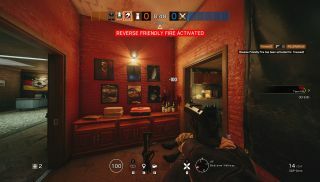 The new system leaves a significant loophole for griefing still open: Caveira. With her Luison pistol that sends players into DBNO, she can down all of her teammates before leaving the match and losing the round. Because of this exploit, some think reverse damage should activate after a certain amount of friendly damage is inflicted, not complete teamkills. I'm a little mixed on the new rules. It's great that griefers can't do as much damage anymore, but it also feels like their behavior is going unpunished in the long term. I'd rather kick a griefer and be down one player than be distracted by their shenanigans. Ubi's plan for penalties is a bit wishy washy under the new rules. "We will continue to track team kills, and we may issue appropriate sanctions after multiple offenses." The "may" does a lot of work there. Without a clear-cut ban for multiple TKs, Ubi is possibly obfuscating what a real griefer looks like in their data. Unless someone looks very closely, it might be hard to properly punish someone that is griefing in every match. I guess the devs are hoping reverse damage ruins the fun of being a jerk, but I wouldn't count on that. Ubi will be testing the new teamkill system on the test server and iterate based on feedback before releasing on the live servers. The devs seem pretty confident in what they've got here, so I don't foresee many changes before it's live.